September 2018 marks 30 years of the Lisburn Downtown Centre! 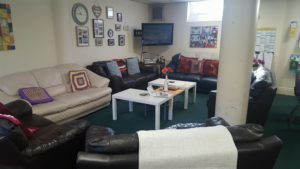 The Centre was established to support those feeling isolated and alone within our community; to develop people’s social networks and help them deal with social, physical and mental health needs. 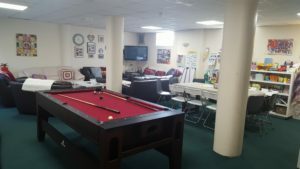 Downtown offers structure and support to individuals struggling with everyday life. We aim to facilitate the growth of social networks, vital in ensuring people feel supported and cared for in our community. This is paramount in enabling members to overcome their daily struggles. We facilitate 7 different support groups benefitting over 150 people, most on a weekly basis. 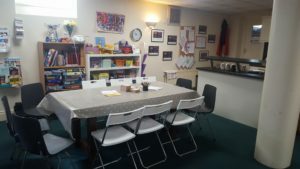 The dedication of our volunteers has enabled Downtown to continue its vital work within Lisburn, and their passion is reflected in the success of our support groups. The nature of our volunteers has produced a welcoming, non-judging and relaxed nature at Downtown. Vital when facilitating sessions focused on mental health and methods to cope. We want to create a Centre which reflects the vitality, passion and dedication of its volunteers. Downtown has always been done ad-hoc, with donated furniture and electricals. The Centre is tired. A major refurbishment will enable us to bring in our 30 years with pride! And solidify our position within the Community. The Centre will see new flooring and ceiling tiles throughout. A larger and more user-friendly restroom which will free up space for an in-house store (perfect for all of our arts and games supplies!). For the first in 30 years, we will purchase brand new coordinated furniture based on the colours of our logo. This furniture will be user-friendly to all and enable all members to join in together. The Centre will get a total overhaul with part re-plastering and a full paint throughout. With thanks to the Rotary Club of Lisburn, the ARN Foundation, the First Lisburn Presbyterian Church and the Clothworkers Foundation; we have received donations and grants to enable the project to begin in June 2018. With the aim of completing all work by September 2018- In time for our 30th anniversary. To enable this, Downtown will need your support! Additional funds are needed to ensure the work is completed on time and at a high standard. The Downtown committee are hosting a Golf fundraiser on 14th June, all proceeds will aid our refurbishment. The renovations are complete and we are proud to say we are Queen’s Award Recipients!